Mr. Fish is a Mom and Pop Restaurant owned by Father/Daughter team Ted and Sheina Hammerman. Ted otherwise known as "Mr. Fish" has been wheeling and dealing seafood along the Grand Strand for the better part of thirty years. After many worldly trips that included Asia, South and Central America teaching people how to produce and package seafood for export; he came back to nestle in Myrtle Beach and focus on his whole seafood operation. They offer an extensive menu offers a variety of seafood platters,combinations, sandwiches,specialty items including fish tacos, shrimp and grits, seafood Alfredo, we also offer sushi as well as items on our raw bar. 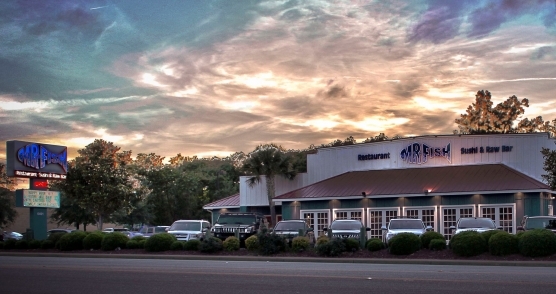 You will want to check them out on your next Myrtle Beach golf vacation.